BEVERLY - Tracy (McLean) Kureta, 57, died peacefully Thursday, January 24, 2019 at the Kaplan Family Hospice House, Danvers surrounded by her family and friends after a lengthy battle with breast cancer. She was the beloved wife of Gary Kureta. Born in Salt Lake City, Utah on January 25, 1961, she was the daughter of the late Major Gen. Joseph McLean and Eileen (Buckley) McLean. An army brat, she spent her first few years living at the Dugway Proving Grounds in Utah, before moving to Peabody and finally settling in Beverly in 1988. Raised most of her life in Peabody, she was a graduate of Fisher College and Northeastern University. Before her sickness, she worked in Operations Management for Hasbro and Atari, followed by a career in Sales and Buying Management for RMT Sales and Entertainment Liquidators of Canada. Tracy had three passions in life, her son Brian’s football career, the San Antonio Spurs and Siberian Huskies. While going through chemo, she attended every college football & semi-pro games. Even traveling as far as Salem, Virginia to see her son play in the college All American game. A die hard Spurs fan, she stayed faithful to the team, through good times & bad for over fifteen years. 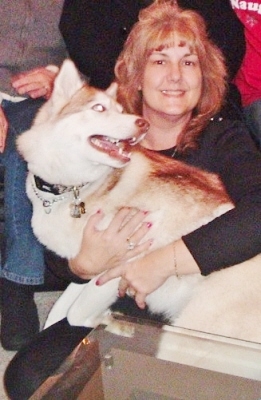 Having raised Huskies for over thirty years, she sat on the Board of Directors as secretary for the Patriot Siberian Husky Rescue, helping by re-home Siberian Huskies in need. She would do whatever it took from driving dogs two hours to foster homes to helping with fundraising. In addition to her husband of thirty years, she is survived by her son, Brian Kureta and his companion, Jamie Ventura of Salem; her niece and nephew Amy & John Gore; her mother-in-law, Barbara Kureta; two sisters-in-law, Susan Kureta and Tonia Grant and her husband, Mark; brother-in-law, Keith Kureta and his wife, Kelly and her beloved husky, “Blaze”. She was also predeceased by her brother, Terry McLean, father-in-law, Manny Kureta and her huskies, Bandit, Blue and Prince. Her funeral Mass will be celebrated on Saturday in St. Mary Star of the Sea Church, 253 Cabot Street, Beverly at 10 a.m. Visitation will be held in the church prior to the Mass from 9 a.m. Relatives and friends are cordially invited to attend. Interment will be privately held in St. Joseph’s Cemetery, Lynn. In lieu of flowers, donations may be made in her memory to Patriot Siberian Husky Rescue at pshr.org or mail to Patriot Siberian Husky Rescue Organization, 684 Bridgewater Hill Rd., Plymouth NH 03264. Information, directions and condolences at www.campbellfuneral.com . To send flowers or a remembrance gift to the family of Tracy A. Kureta, please visit our Tribute Store. "Email Address" would like to share the life celebration of Tracy A. Kureta. Click on the "link" to go to share a favorite memory or leave a condolence message for the family.